Steven (Chicagoland, United States) on 3 June 2010 in Architecture and Portfolio. Composed of circular marble steps, a portico, a circular colonnade of Ionic order columns, and a shallow dome, the Jefferson Memorial is open to the elements. Pope made references to the Roman Pantheon and Jefferson's own design for the Rotunda at the University of Virginia. It is situated in West Potomac Park, on the shore of the Tidal Basin of the Potomac River. The Jefferson Memorial, and the White House located directly north, form one of the main anchor points in the area of the National Mall in D.C. The Washington Monument, just east of the axis on the national Mall, was intended to be located at the intersection of the White House and the site for the Jefferson Memorial to the south, but soft swampy ground which defied nineteenth century engineering required it be sited to the east. Photo taken on May 5, 2010. That is a very nice view point. It gives a feel of scale. oh, this is such a pretty composition . Superb composition and light is very beautiful. Have a lovely afternoon Steven. The tone mapping really brings out the texture in those columns. I think greek coliseum here.. the perspective is absolutely awesome! Oh, this is a gorgeous shot with the warm light up top. Superb work! Beautiful architecture! The various tones of marble are surprising. 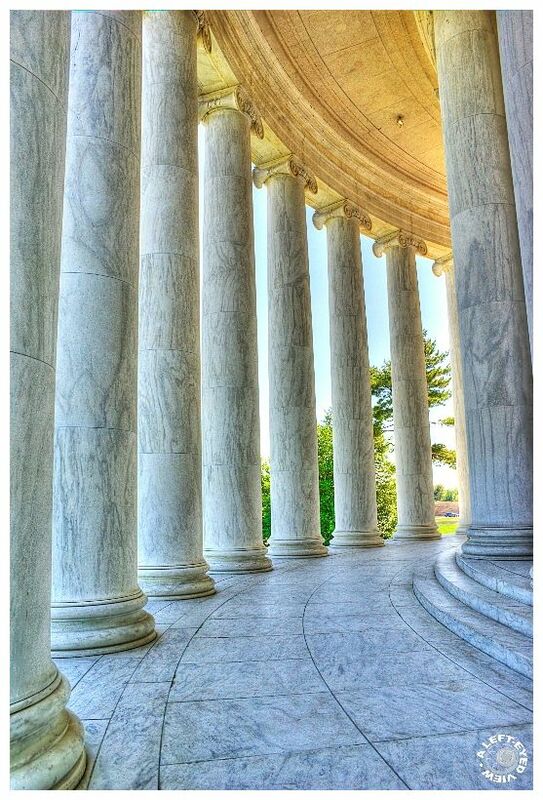 Wonderful use of HDR Steven - it reveals incredible detail in the ceiling and columns - 5 stars!